UNITED NATIONS, May 31 2013 (IPS) - It’s Sarah Schilling’s usual manner of greeting when she meets other members of her tribe: “Aanii Sarah Schilling n’diznakaas, which translates to ‘Hello, Sarah is my name’ in English,” she said. “The language is called Anishnaabemowin, the Odawa native language,” Schilling explained. She belongs to Little Traverse Bay Bands of Odawa Indians, a Native American tribe. It was in 2009 that she and her peers decided to come up with the tribe’s first youth council. And it’s no child’s play. Schilling and other members of the council created their own constitution, bylaws and code of conduct. Schilling organises conferences and retreats to address issues that teenagers like her are grappling with, such as drinking and suicide prevention. “I guess young people from the tribe are confused as to what their role is as Native Americans,” Schilling told IPS. While she acknowledges that straddling two worlds can be a challenge, she also thinks that the U.S. educational system often depicts Native Americans as “aggressive and bad guys”. There’s more to Native Americans than beads and feathers, but in an urban setting Native teens have a hard time fitting in, said Schilling, who chose home schooling over public school after sixth grade. She is one of the “2013 class of Champions for Change”, a new programme run by the Center for Native American Youth, a non-profit organisation in Washington. Native Americans make up about one and a half percent of the total U.S. population, but 12 percent of the homeless population, said Erin Bailey, the centre’s director. “Through this programme we wanted to create a narrative about what was really working within the community, and share inspirational stories that are impacting people’s lives,” Bailey said. 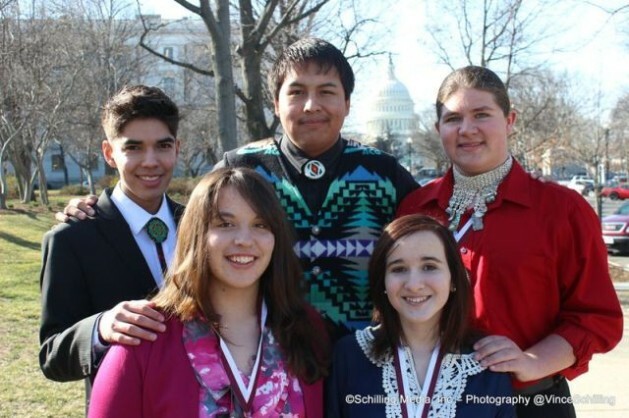 The programme honoured five young Native Americans for their services to the community. From healthcare to education, these “champions” range from 14 to 22 years old. Like Schilling, Cierra Fields is a “champion”. A brave heart, who conquered cancer when she was barely five years old, Fields says she “was actually born with melanoma”. Fields, who is 14, belongs to the Cherokee Nation of Oklahoma. Through her personal story, she encourages people to talk about cancer. She also shares tips on preventing cancer. For the audience, Fields’ story is a huge wake-up call. Fields is also part of the Cherokee Nation Youth Choir and can speak conversational Cherokee. While Fields tries to spread awareness about cancer, 19-year-old Vance Home Gun from Arlee, Montana tries to spread awareness about the Salish language, which he says is dying. Gun belongs to the Confederated Salish & Kootenai Tribes. Every Sunday for four hours, Gun teaches the Salish language to a motley group of students interested in learning it. Gun also helps make Salish language curriculum available in public schools. He believes that language is more than a mere medium of communication but an integral part of culture. “Salish is spoken by 40 to 50 people. Therefore, it is very important to keep our culture alive through our language,” said Gun, who intends to major in linguistics and anthropology in college. Some of these “champions” have already charted out their career path in their heads. For 14-year-old Dahkota Brown from Jackson, California, aspirations extend beyond going to a law school. “I want to be a tribal judge, possibly the first United States Supreme Court judge who is a Native American,” said Brown, who belongs to the Wilton Miwok tribe. Brown started a study group called Native Education Raising Dedicated Students (NERDS). NERD helps Native American students with their grades in schools. Browns’ aim is to “instill confidence” among students who approach the group for help. A magazine article on high suicide and dropout rates among Native American youth triggered the idea to come up with a project to help such students, Brown said. “Also, I noticed that Native American students around me weren’t doing well in school,” Brown said. The reasons could be many, but “Bullying and criticism could kill their self-confidence,” he said. Brown himself has been a victim of bullying. He was teased as “a girl” for his long hair. “There is a custom in my family according to which I cannot cut my hair until someone in my family dies. Other students did not understand this when I tried to explain,” he said. His peers also did not approve of his dress. “I love wearing feathers on my hat and Native American shirts. Therefore I stood out because of my traditional regalia and people would make fun of me,” Brown said. But that did not stop him from identifying himself as a Native American or emerging as one of the winners in the “champions for change” programme, thus adding another feather in his cap. But some are quick to point out the United States’ government’s failure to address Indigenous issues. Joaquin Gallegos from Denver, Colorado doesn’t mince words. The United States has not done justice to internationally recognised treaties it has made with these Indigenous sovereign Nations, he said. One of the “champions” awarded for his work, Gallegos is part of a project that aims at improving the oral health status of Indian Tribes in the Southwest United States. This 22-year-old also wants to work toward providing Native Americans with improved healthcare facilities. We need more young people like this! !